This listing is for small (<10 yd) quantities of designs that are not currently available for public purchase. Orders are placed through MyFabricDesigns.com and ship directly to the buyer. 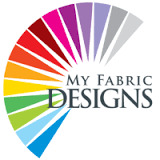 Prices are based on MyFabricDesigns' rates. Shipping is a best guess based on past experience with MyFabricDesigns and subject to tweaking as more data is gathered. Any overpayment of shipping charges will be refunded. An asterisk (*) indicates closeout pricing for a particular fabric type.